I am a ZOOMA Great Lakes ambassador! I am thrilled to be an ambassador for the ZOOMA Great Lakes Half Marathon this year! Register at http://zoomarun.com/race/great-lakes and use the promo code “KAYLA2018” for a discount off any of the races. ZOOMA Great Lakes offers races for women of all abilities, as well as a post-run celebration, yoga sessions, and great swag — all against the incredible backdrop of a Midwestern lake in the fall. Join me for the weekend. Bring your mom, your sister, your girlfriends. I promise you’ll have an incredible experience! And I promise, I’ll be one of your biggest cheerleaders! Next price increase is May 1. *Fun fact: I worked as a reporter for the Janesville Gazette for a couple of years, and I covered Walworth County, which includes the city of Delavan. This year, things were better. Much better. This year, this race had to be better. I approached the starting line relaxed — as relaxed as one could be after battling some hamstring tendinitis the few weeks before the race and in the face of 25 mph winds and dropping temperatures. I lined up with the 4:30 pace group and planned to stay just ahead of them as long as possible. The race started at 6:30 a.m., so the sun wasn’t even up yet! It also started in a new location (in the Fifth Ward, in an area known as the Reed Street Yards, just southeast of the Harley Davidson Museum campus), so we had about 3 miles under our belts before we headed north and uphill on Lincoln Memorial Drive, along the lake. I felt surprisingly good, considering my hamstring, back-of-the-knee, and calf pain kicked in almost immediately upon running. I focused on shortening my stride and increasing my cadence as much as possible, and I think that helped not only keep the pain manageable, but also distracted me a bit, since it forced me to think about something other than the pain. The early portion of the course is my favorite, as it takes us through familiar haunts from the lakefront over to Brady Street and down Old World Third Street. I continued to keep the 4:30 pace group just behind me until about 14.5 miles, somewhere along Sherman Boulevard. I also saw Christopher on this out-and-back stretch. The first two-thirds of the race remarkably “flew” by, considering the wind (a 25 mph headwind all the way out Wisconsin Avenue), the challenging course, and the aches and pains in my right leg. I kept on running, feeling fairly relaxed and in control — which is paramount amidst the gritty miles (Miles 16-22). This portion of the race takes us through the lonely Miller Valley and then onto the quiet, albeit scenic Hank Aaron Trail and through Mitchell Park, before heading back to the Reed Street Yards. I jogged (it was a much slower run by this point) and jogged and jogged, only walking into and out of the water stops. I continued to marvel at the fact that I had made it this far, and I was still running! I kept repeating to myself, “Be brave.” I continued to remind myself that I was doing much better, physically and mentally, at this point than last year. It was around this point — Mile 21 to 22 — that my RunKeeper went from being about a quarter of a mile ahead (measuring long, which is typical) to being about a third of a mile or more behind (measuring short). 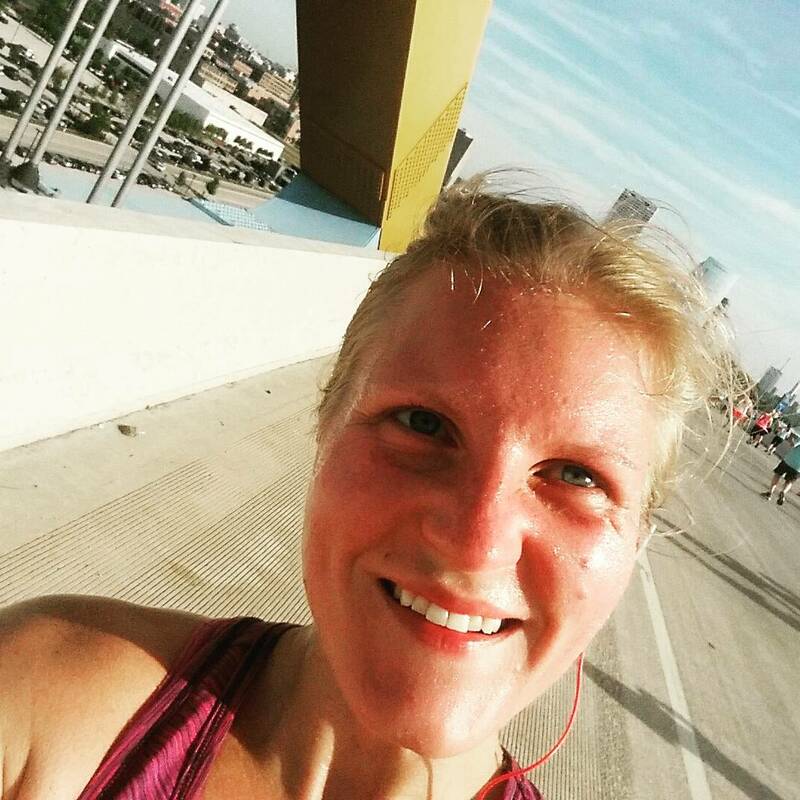 I couldn’t quite process what that meant at the time, so I relied on the mileage signs on the course, and I pressed on through Miles 24 and 25, then down the 6th Street viaduct through Mile 26. The last two-tenths of a mile — that was it! The crowd thickened. The finish line was in sight. My body had carried me this far. I hustled across the finish line, exhausted, relieved, and proud. I hobbled through the muddy finish area to find Christopher, who was with my dad, and we swapped stories (Christopher finished in an incredible 3:51!) over our free beers under the cover of a pop-up coffee trailer. We hardly stuck around, through; it was too muddy, too windy, too cold. Marathon No. 5 done, albeit with a couple of asterisks next to it. I served as a race ambassador for the Milwaukee Marathon, so I really tried hard to support and promote the race from the day we received our marching orders. I talked about it as much as possible within the context of my social media, and I volunteered to promote it at the Rock ‘n’ Sole Half Marathon expo in June, and I staffed the information booth at the expo Saturday. I had good intentions to do more, like visit the Quad Cities running stores, speak to the Corn Belt and Rock River Road Runners, but we got majorly caught up in searching for, buying, and moving into a new house. If we’re being honest, though, I expected more out of my role. I know ambassadors were “expected” to recruit a certain number of people to the race to receive perks, and perhaps none of us met those benchmarks…but I haven’t heard a word about my “success”. If none of us, or very few of us ambassadors met these expectations, perhaps the race organizers could have scaled them down? I would have loved an additional thank you for at least making the attempt to get behind this race…which two years in a row now has run into its own problems, and is, as a result, not making a good case as to why runners should support it as the city’s only marathon and why it could be world-class, big-city race. I want to continue to support the Milwaukee Marathon. I want it to succeed, for my city and for this sport. I hope the new organizers take our feedback seriously, and I hope runners who felt burned give them one more chance next year. Hello, friend! It’s been way, way too long since we’ve talked. But what’s a few months between friends? This spring and summer have been extremely busy for the Heimerman household! Christopher accepted a job as the news editor of the DeKalb Daily Chronicle in April. He commuted the 75 minutes each way between Sterling and DeKalb in the initial weeks as he felt out the job and made sure it was smart and worthwhile for us to uproot our family and our life and start over in a new city. We furiously searched for houses in DeKalb and fixed up (new microwave and dishwasher, new front window, new shower) and cleaned our house in Sterling, and ultimately, the sell-one-home-and-buy-another-home process took only 10 days. It was a very emotional two months, as we prepared to leave our first home–the site of so many firsts for our family–and as we prepared to leave Sterling–a community we had truly grown into and in which we made meaningful friendships over 5 years. In the last few weeks leading up to the move, and especially in the last week, as we packed during the free moments between work and school, I had many weepy moments. I just couldn’t fathom leaving it all behind. And yet, I was so excited to start anew. It was an emotional rollercoaster. We moved June 30 and July 1 and were completely settled within just a couple of days. I landed some part-time work as a group fitness instructor at the Kishwaukee Family YMCA. I am co-leading a senior strength and balance class three mornings a week, and starting after Labor Day, I will also lead a bootcamp class four mornings a week. I have filled in as a pilates, yoga, and BodyPump instructor, too. I also studied for the NETA personal training certification. I went to the certification workshop Aug. 5-6, conveniently hosted at the local YMCA, and took the exam Aug. 6. After more than three long weeks, and after the exam results were mistakenly sent to our old address, then forwarded to our new one, I learned yesterday that I passed the certification exam with flying colors and now am a certified personal trainer! I’ll jump right into training within the next few weeks, and while I’m a bit nervous as to how to go about it all, I’m really excited to embark on this new journey–and honestly, to have a meaningful career in a growing industry. I had a meaningful career as a reporter, too. I am an excellent writer and storyteller and a solid journalist. But while I enjoyed being a reporter, I most enjoyed meeting new people and telling their stories; I never was in it to be a watchdog, to uncover the truth, to right the wrongs of the world. I just wanted to tell stories that were important, that were special, that made people feel important and valued. I discovered that I can do all that and more as a group fitness instructor and now, as a personal trainer. I will meet new people, I will learn their stories, and I will hopefully help them write new and better stories for themselves. I will honor people where they are, and I will value them and hopefully help them value themselves, so that as we work together, they want to be the best version of themselves, inside and outside. Anna and Elise finished up 3-year-old preschool at St. Mary’s in Sterling in May. They had a fabulous year of learning, discovering, and growing. They are so smart and funny, and they are very well-behaved. They start school at the YMCA on Tuesday. They will go to a 4-year-old Kingergarten-like program five days a week, from 9 a.m. to noon. And they get swimming lessons, sports, and music throughout the week. It’s not a traditional preschool program, like what they had at St. Mary’s, but it’s got its perks (swimming lessons!) because they’ll be at the YMCA. We’re definitely ready for school–for the girls to get back into that routine, and for me, personally, to dive a little deeper into my new jobs. All this time, Christopher and I still have been running. We trained for and ran the Summerfest Rock ‘n’ Sole half marathon on our wedding anniversary June 10. (I had good intentions of writing a race recap, but I got caught up–and rightly so–in moving and changing jobs.) Christopher posted a great time, considering the incredible heat and humidity that day, but I really battled, and so I just ran for the fun of it. We took just a couple weeks off to move and settle in, and then we picked back up and now are in the waning weeks of training for the Milwaukee Marathon on Oct. 15, for which I am a race ambassador. (Use code KaylaRunsMKE for a discount on any of the races!) Both Christopher and I are doing well, especially with our long runs. We’re scheduled for two 20-milers, one next weekend, and the other two weeks after that. Distances that long still sort of freak me out, but not nearly the way they used to scare me. #thingsdistancerunnerssay I’m excited for the marathon, and I hope it’s a better race than last year. That’s the long and short of it. Lots of changes, lots of adjustments, but already some good stories and memories. I am a Milwaukee Marathon race ambassador! I am thrilled to be an ambassador for the Milwaukee Marathon this year! The running festival, which features races at all distances for all abilities and paces, is sure to be the event of the year in the City of Festivals — my beloved hometown of Milwaukee. Register at www.runmilwaukeemarathon.com and use the promo code “KaylaRunsMKE” for a discount off the marathon, half marathon, 10K, or 5K. It’s more than a new name, new date, and new finish line. The @mke_marathon weekend Oct. 14-15 is an opportunity to challenge yourself and run the streets of Milwaukee’s distinctive and diverse neighborhoods. Join me for one of the races. I promise you’ll have an incredible experience! And I promise, I’ll be one of your biggest cheerleaders, whatever challenge you take on. Next price increase is July 1. Disclosure: I was sent the Winter Blend shampoo and conditioner set to review. I am not otherwise being compensated for this post. All opinions are my own. My beauty routine is pretty simple, and thus, my arsenal of haircare, skincare, and cosmetic products is pretty small. In terms of shampoo, conditioner, body wash, and face wash, I prefer products that are fairly natural with clean, fresh scents and that leave my skin feeling clean and invigorated. Maple Holistics, an American company that makes all-natural haircare and skincare products, with an emphasis on shampoo and conditioner, offers several items that fit that bill. I’ve used their Winter Blend shampoo and conditioner over the past 8 weeks, and I love it. The limited edition Winter Blend formula contains five varieties of mint: peppermint, spearmint, eucalyptus mint, bergamot mint, and wild mint. The scent is lovely and transforms your shower into a cooling, refreshing environment. It’s perfect in the morning, to wake up your senses with the brightness of invigorating mint; it’s wonderful after a sweaty workout, too, to cool and refresh your body and mind. The conditioner specifically is Maple Holistics’ own Silk18 blend of ingredients to treat dry, damaged hair; it contains 18 silk amino acids, plus argan oil, jojoba oil, botanical keratin, sea buckthorn, pomegranate, aloe, and more. The shampoo, naturally, left my scalp and hair feeling clean, thanks to the bright mint blend. And the conditioner, which feels thick and silky straight out of the bottle, left my hair feeling soft and smooth. The two 8-ounce bottles retail for $19.95, which is far more than I would ever pay for shampoo or conditioner. But you are paying not only for high quality products, but also for products that are all natural, sulfate free, and made (animal-cruelty-free) in the United States. So if natural hair and skincare is important to you, and if supporting domestic manufacturers is important to you, Maple Holistics offers some wonderful products. The company currently offers free samples of its lemon oil, massage oil, or sage shampoo in exchange for honest reviews online, either on social media, a blog, or Amazon. The offer is good only through March 17!